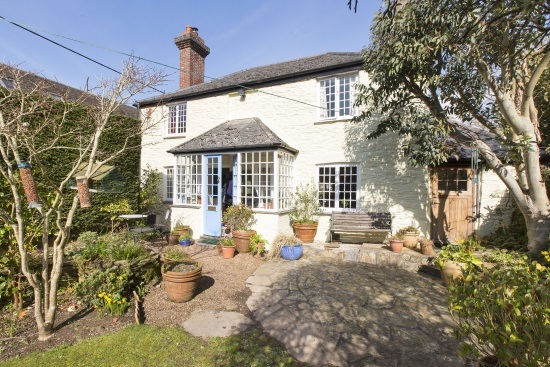 A stone’s throw from the picturesque creek at Bridgend, where the beautiful Yealm Estuary ends, you will find a charming stone cottage dating back to the early 19th century. Bridgend Cottage is conveniently tucked away yet only a short distance from Bridgend Quay with its public slipway making it ideal for sailors or just messing about on the water. As soon as you step into Bridgend Cottage you feel a warmth and cosiness but also a sense of light. The property has a welcoming dual aspect sitting room with a window seat and feature fireplace fitted with a wood-burning stove. There is solid oak flooring and a door opens into the beautifully presented kitchen/dining room which is bright and airy with window seats to both windows at the front. The kitchen is well fitted with a good range of modern white units and integral appliances and there is a separate fitted utility room with a vaulted ceiling. Completing the ground floor is a shower room and upstairs are three bedrooms – two doubles and a single, all with fitted wardrobes. There is a well-appointed family bathroom with a fully tiled shower cubicle and bath and solid oak flooring. On the landing the windows have working shutters. Outside is a stone built triple garage and there is also parking for up to three vehicles. The well maintained pretty cottage garden contains a variety of plants, mature shrubs and trees and a paved patio area. The popular villages of Noss Mayo and Newton Ferrers face each other across the Yealm Estuary surrounded by unspoilt coastal countryside in the ownership of the National Trust and contain many local amenities. The revitalised city of Plymouth is a short commute away and good transport links are within easy reach. Marchand Petit’s Newton Ferrers office (01752 873311) are quoting a guide price of £455,000 and welcome a call for further details and to arrange a viewing.